Energy Swing Windows are your local experts for bay and bow window installation, providing high quality products and expert craftsmanship. Call us today at 1-844-385-9318 or click below to get a free estimate on replacement window services in Monroeville, West Mifflin, Bethel Park and the nearby areas. Bow windows make for a beautiful focal point of a home's design. Inserting new bay windows or bow windows into your home is a great way to alter the look of your home without much structural change. Energy Swing Windows builds the casing, manufactures the windows, and installs all bay or bow windows. Custom make your bay window with choices in wood, stains, window frame colors, and depth dimensions. We will help you determine which window best matches your wants and needs. Energy Swing bay and bow windows are comprised of two of our swing-in double hung windows and one pivoting center picture window. This combination of picture and double hung windows makes for a very easy cleaning experience from inside your home. Our new client in Greensburg was sent to us by a current customer with glowing reviews! They wanted to not only put new, more energy efficient windows into their home, but wanted a beautiful update as well. Energy Swing Windows was able to install this gorgeous bay, and the customer couldn't be happier with the finished product! This customer was looking to add some extra dimension to their home. Their old window was a large picture window with two small, double hung windows on the sides. Energy Swing Window's expert installers replaced it with this beautiful bay! The customers were thrilled with the results!! A bay window is usually a crowd pleaser in most homes! It is a lovely setting to relax and read a book, and also provides the area with a great amount of natural light. The bay window gives some additional dimension to the exterior of the home as well. At this home in West Newton, our skilled installation technicians removed these mulled, double hung windows and reconstructed it into a beautiful bay! Our customers over overjoyed with the results and how tidy our crew kept their home during the process. Here's a view of the front of a home where Energy Swing Windows replaced double hung windows and also converted one opening to a beautiful new bay window. Having this combination is aesthetically pleasing as it is practical. Energy Swing Windows specializes in replacement windows that are designed and manufactured to last. We install vinyl bay & bow windows, which will provide you with the beauty and functionality you need. Our professionals are happy to replace old bay and bow windows with a newer, more efficient unit. We provide free estimates on all our replacement window services. If you're looking for expert window replacement, contact us today! 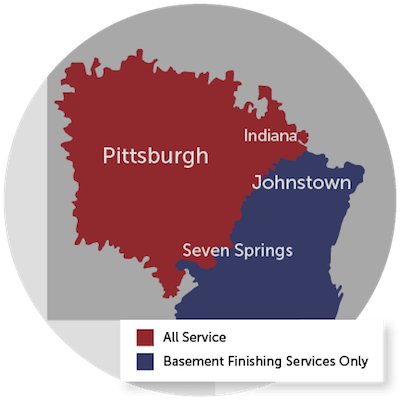 We proudly serve West Mifflin, Bethel Park, Monroeville, Irwin, McKeesport, Coraopolis, New Kensington, Greensburg, Export, Trafford, Canonsburg, Latrobe, Bethel Park and many areas of Pennsylvania.